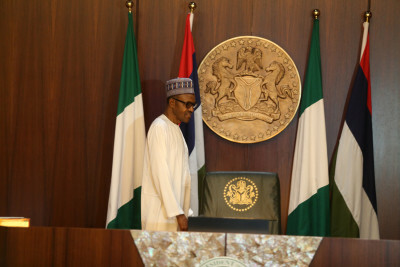 DESIROUS of setting unambiguous direction for the new Federal administration inaugurated last Friday, President Muhammadu Buhari and his Deputy, Prof. Yemi Osinbajo, have declared their assets. The development was confirmed via a statement by Buhari’s Media Team in Abuja yesterday which disclosed that the Code of Conduct Bureau on Friday acknowledged the submission of President Buhari’s and Vice President Osinbajo’s assets declaration form submitted separately on May 28, and signed by the organisation’s Chairman, Sam Saba. He said Buhari’s ID was given as: ‘President: 000001/2015’. “The Nigerian Constitution states in Chapter VI Section 140 that a person elected to the office of President shall not begin to perform the functions of that office until he has declared his assets and liabilities as prescribed in the Constitution. “While seeking election into the highest office in the land, the President had promised Nigerians that he would publicly declare his assets as soon as he took over government,” the statement noted. Meanwhile, apart from insecurity, Buhari has identified the frightening rate of unemployment in the country, especially among the youth, as a source of potential danger to the country’s stability. He has, therefore, vowed that his administration, riding on renewed global confidence in the country, will seek the support of allies in Europe, the Americas and African towards tackling the menace. He sought the support, patience and understanding of Nigerians with his new administration, in view of the fact that the country has suffered a lot of damages in the recent past. Buhari gave the indication in his remarks during a Gala Night at the banquet hall of the Presidential Villa, Friday night. He said his administration would focus on agriculture and mining in order to engage unemployed youths who form more than 60 per cent of the population. He said: “The most frightening thing in my personal experience during my visits to all the states of the federation, except Yobe, there were youths in the sun for six to 10 hours that would meet us at the point of entry, either at the airport or border. They would dictate the pace of our movement to the venues where we address the people. “These youths would be sweating. And I know that more than 60 per cent of our population is youths. Most of them are not employed, whether they are in school or not. This is the keg of gunpowder we are sitting on. We have made our points to Nigerians and to our friends that we would try and secure Nigeria as soon as possible. We are going to articulate our requirements when we study the handover notes from the previous government and consult our immediate neighbours and our friends in Europe and America to help us. “We have identified the quickest way to go about it through agriculture and mining, to feed ourselves and get everybody employed. The cooperation promised by our friends and the understanding displayed now by our elites will make it possible for us to make progress. Speaking during a church service at the National Christian Centre (NCC) Abuja to mark his swearing-in as Vice President of Nigeria, Vice President Yemi Osinbajo said he was chosen by God to help President Muhammadu Buhari transform the country and he is convinced that God’s plan is to set things right and heal the country through the new administration. Osinbajo, who was, until his election, a Senior Pastor in the Redeemed Christian Church of God (RCCG), said: “I thank the great and mighty God who has chosen me at this time by Himself to assist the President of this nation. His plan is to make Nigeria a nation that will be admired and respected among nations of the earth by establishing integrity, by ensuring that corruption is eradicated and resources meant for all are not cornered by a few, but are used according to law, justice and equity for the benefit of all. But 48 hours after Buhari was inaugurated, there is yet no word on appointments of personal aides to assist the President and his Vice in the day-to-day running of government. That seems in sync with Buhari’s austere style of doing things his own way. At other times, appointments were made as soon as inauguration ceremonies were done with, but not so this time. Checks with some of those who worked in his presidential campaign team yesterday suggested the President could name some appointments this morning. Independent sources say the delay in rolling out, including even naming aides who do not require legislative confirmation, is not unconnected with contentions among camps within the APC over appointments. Good start. May God Almighty provide them with the enabling environment to move our great country to the next level of greatness among the comity of nations. It is my humble suggestion that as a matter of duty and compassion the government of PMB provides bailout to the Federal government, States and Local Governments to settle arrears of salaries and pension up to June 2015. Section 14 (2)(b) of the Amended Constitution of the Federal Republic of Nigeria 2011 states that : THE SECURITY AND WELFARE OF THE PEOPLE SHALL BE THE PRIMARY PURPOSE OF GOVERNMENT. Taxes emanating from the salaries should be paid back to the Federal government .The balance should be deducted at source in 24 or 30 monthly installments as it pleases each tier of government. God will be happy with the new President and Vice President if this can be done .The Holy Bible and the Holy Quran are not in agreement with delayed payments of workers wages. I wish the President and the Vice President a peaceful and very successful tenure of office. we must make any head way towards rebuilding our trust to the crap called journalism in this country. If GMB and his deputy declared their assets as this piece said,how much is their respective worth?. That is the problem with Nigerians. The constitution says the duo must declare their assets which they have already done. The constitution did not say they must announce their worth to the public. Any interested person who want to know how much they are worth can just walk into the Code of Conduct Bureau and ask to see the forms. There is FOI – freedom of Information law in Nigeria. You can only cry when this information is denied you until then the President and his Vice has performed their obligation. Go and perform yours by finding out how much they are worth. So, u really thing just ANYONE can go to Abuja and ask of their worth? Please! The constitution may not demand that they make it public, but the whole garment of so-called integrity that they claim, makes it a moral requirement for them to declare publicly. There is something very insincere and mischievous about this secret declaration. I do not expect less from the two of them. I would grade this report as D-. The reporter got the press release and just published it. Where is investigative journalism? What are the contents of the declaration forms? This is not the same Guardian where I worked. Something has gone awfully wrong in the newsroom. The editorial team must do better. Which is why some of us as suspicious of the secret declaration. Everyone they say is free of his own opinion and various people have posted their opinions here but let me add that the myriad of problems facing Nigerians now is more than presidential assets issue. I think Nigerians should focus more on seeing how the duo would move our nation forward and not beating around mere issues. the duo has declared their assets, that’s what the constitution states so lets move to the next agenda, the country is in a mess, over 150 millions Nigerians are abroad so the works of rebuilding the nation is utmost important at this time, please Nigerians be focused.